or Firenze as it is known in Italian is one of those cities that everyone and their dog dreams of going to and to be honest… it’s not a city I love. 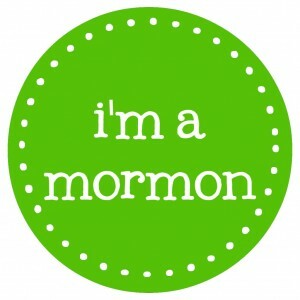 My first visit was in 2009 with my sister in law. You can read about it here. (please excuse the overly saturated colors in the photos- crappy app was used) While I initially enjoyed my trip, the more I thought about it, the less I enjoyed. I don’t like to post negative things about places because I don’t want to hurt anyone’s feelings. So I didn’t post about the B&B experience and the bites from bed begs, the subpar food, and just overall feeling of the city. I knew there had to be more to Florence than what I had seen. So when my sister in law and oldest niece decided to visit us in Torino, I didn’t hesitate when they said they’d like to visit Florence. I took this as a chance for Florence to redeem itself and for me to see the city through another set of eyes. The first time around, I watched episodes of Rick Steves show to get me in the mood. In 2009, I had only been blogging for almost a year and hadn’t really gotten in touch with anyone from the blogging community just yet. 8 years later and my social media contacts have basically covered most of my needs and I was about to see the city as a mother. 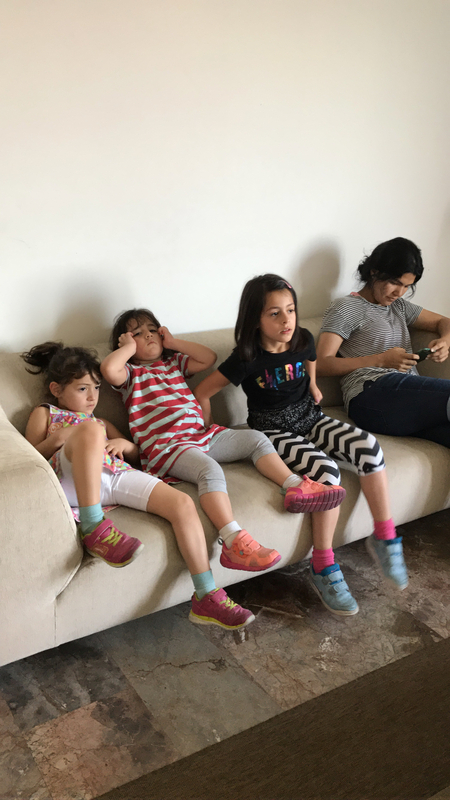 I wanted to stay in an apartment rather than a B&B or hotel because it would be more comfortable for all of us… not to mention it would be difficult to keep them quiet! For this, I chose Apartments Florence. I have a friend who works for them and I knew that she would help me with the best apartment for our budget and needs. What we had was a great 2 bedroom apartment in a residential part of Florence. It was furnished, kitchen with all the amenities, bathroom with tub AND shower, dishwasher, washing machine but most importantly.. A/C and working wifi! My only request was that it not be too close to the city center since we wanted a good nights sleep. Our apartment was located 20 minutes walking distance from the city center which is great for adults but not the best when traveling with kids. Our first night we opted to eat at the apartment. Through my extensive research I had pinned two grocery stories near our apartment. We grabbed some essentials like water, milk and cookies so that we had breakfast and snack time covered. In my search for family friendly places I realized that Florence isn’t a city that caters to young children. Most places accommodate families but besides McDonalds, there aren’t many, if any, restaurants that just have that family vibe. This really disappointed me. The food we ate was extremely delicious but I sometimes felt it was wasted when the kids didn’t eat it all. A few times we just found a bakery or bar to grab something quick. The one thing that we didn’t have a problem with is GELATO! Those of you who have have been around for a while know that I love me some gelato. Sadly, there were a few places I was hoping to try but we did manage to get some of the best the city has to offer. 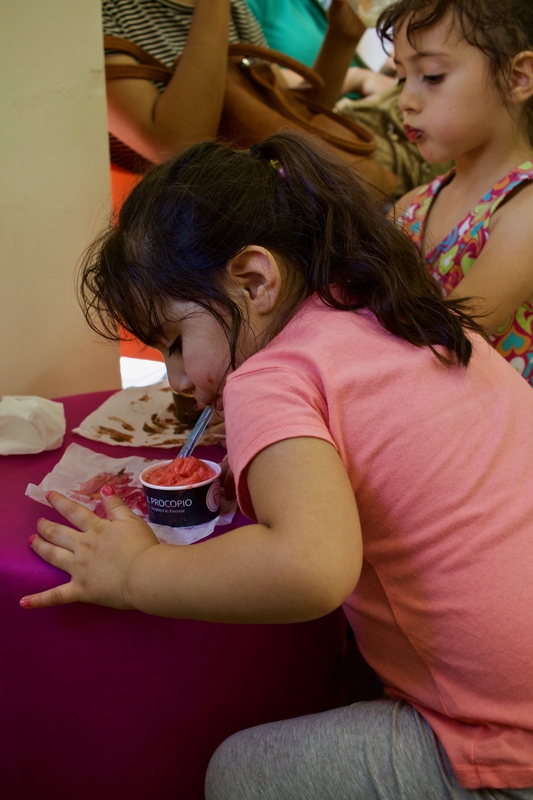 if you get messy eating gelato.. you know it’s good. In order to keep things simple I didn’t plan anything. Yes… that’s correct. We took a poll and decided that the only thing to do was keep it easy for the kids. We made reservations at the Galleria dell’Accademia to see the statue of The David but other than that, we just walked and enjoyed the city’s architecture. 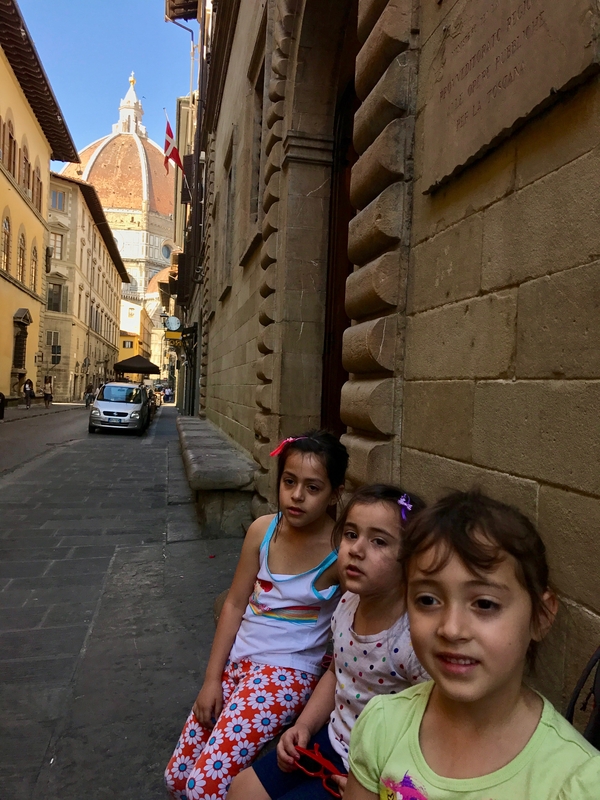 Having to walk with small children in the Florentine heat was challenging and because our apartment was out of the city center, we relied on the bus to get us back for mid-day naps. We took advantage of our A/C and rested, then went back out for dinner and night time strolls. Unfortunately, because of this schedule we walked across the Ponte Vecchio at night but managed to get a view of it the following evening. One thing that was pointed out to me by my friend Christine is the lack of sidewalk space in the city. 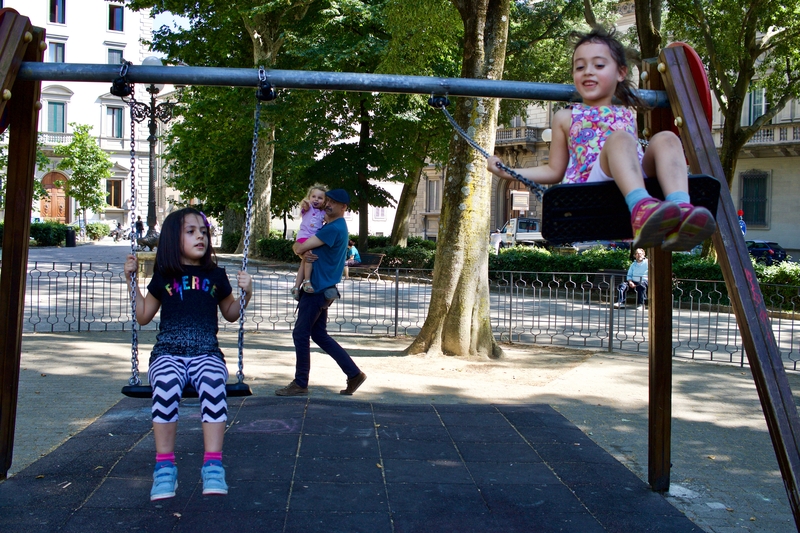 I had a hard time zig-zagging my way with my kids, I have no idea how parents with strollers do it. It was a nightmare. Not to mention having to weave your way in and out of crowds. My niece took a polaroid shot of the Ponte Vecchio and printed it on spot. 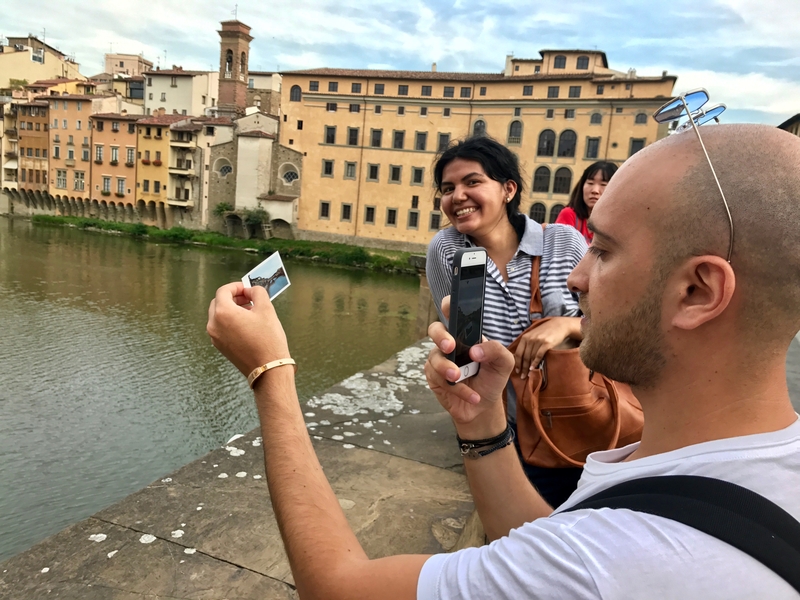 This guy asked to take a picture of her snapshot.. with the Ponte Vecchio in the background. One of the very first things I did was search for the best playground in town. Not just in the city center but the entire city and guess what… There ain’t much! Most of the good stuff is out in the residential areas so walking to a great park isn’t so easy. I was seriously let down when the only shaded playground turned out to be for babies. LITERALLY… infant babies. It was a good thing that my girls each had a bottle of bubbles to occupy them when we stopped to rest. We also made a few trips to Tiger to get some fun things. Once lunch time hit though, we’d make our way back to the room and I had to force them to nap. Walking in the heat wears me out so I know the kids were needed to rest. Overall Florence is a beautiful city and I understand completely why people love it. My bet is that most visit as college students doing a study abroad program OR as young couples (or singles) with no children to worry about… and THAT is probably how it should be seen. The “no worries” and “let’s go for a drink/aperitivo” vibe is much more exciting when you’re not dragging around 3 kids and waiting for 45 minutes for a bus at 11pm.. that NEVER SHOWS UP!! Then you call a taxi and guess what?!?! The EMPTY bus is right behind your cab!!! seriously happened.. and I’m still mad about it!! So while I’m not head over heels in love with Florence, I do think it’s worth visiting.. just not with kids. *Stay tuned for the next Florence posts which will be a more of a photo essay and my thoughts on the gelaterie we visited. I didn’t even try to do Florence with kids. It was so much more enjoyable without them, but I left thinking how wonderful it must be to visit it as a college kid or little lovebird! You’re so right. It’s the same perfect place for college kids or as a honeymoon spot!